Everyone involved in local, community-led action for a better and sustainable future is invited to join EU citizens all around Europe in celebrating the first “European Day of Sustainable Communities” (now each year on 23rd September). We know there are thousands of communities across Europe that are transforming themselves from the bottom up. With ground-breaking initiatives they are writing the blueprint for sustainable living. We too we feel we are part of these communities around Mountjoy Square and beyond! 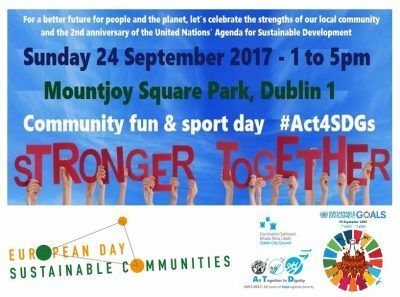 ATD Ireland invites you to a fun and sport outdoor community event in Mountjoy Square Park (Dublin 1) to celebrate community and human rights values which are at the origin of the 17 Universal Global Goals.